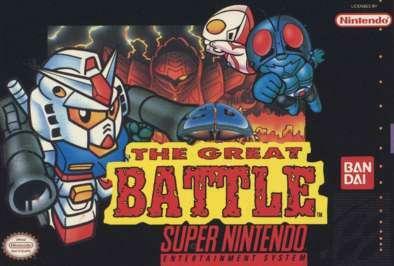 The Great Battle was an unreleased game by Bandai. 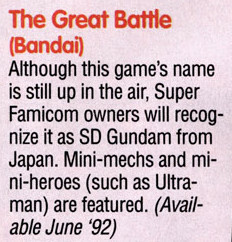 Bandai intended to release SD The Great Battle in the US, calling it simply "The Great Battle". The July 1991 issue of Nintendo Power shows a screenshot of the game in their list of Super NES games, but makes no claim that it would be released in North America (it listed the game under its Japanese title). This title was in the April 1992 issue of Gamepro in a listing of games shown at the 1992 Winter CES, which stated the final name of the game was not decided. It stated that it would be released in June 1992. The game was far enough along that box art was distributed.